“Well, I guess I was wrong!” The remark, accompanied by a sheepish grin, followed the announcement of results of the focus group analysis. It had been carefully structured to guide a landmark strategic plan for the furniture industry in Ontario. The surprise was the revelation that consumers’ primary, up-front interests when shopping were quality, methods of manufacture and style, as simple as that. One 30-something consumer, a high school teacher, his wife a nurse, had spent free-time weeks visiting no less than 40 stores in search of, guess what? a new sofa. “We wanted traditional styling and excellent construction, something that would look good for a long time and would stand up to teenagers and pets. But we just couldn’t find anyone who could answer our questions satisfactorily. They couldn’t tell us about frames, springs, fabrics, leathers. And we didn’t feel we could trust them.” The sad end of the story, the couple had an existing sofa reupholstered! But this misadventure, and others like it, helped to kick off a revolution. Bright retailers responded with high intensity workshops, some conducted by manufacturers’ representatives, some by the retailers themselves. It very quickly became apparent that sales were soaring. Knowledge and the skills to communicate with anxious shoppers appeared to be the answer. “But economic times have changed appreciably since then,” said Tim Rooks. “Because of budget constraints, there have been big cutbacks. Those manufacturers’ sessions were very expensive. Where they do still exist, they’re much smaller, more intimate. Consumers these days do their homework before they arrive at our stores. They read design magazines, watch television shows, read books, research on the Internet, and they want to be greeted by intelligent, well-informed store personnel, real authorities on their product lines. Tim is Manager of Training for Federated, in charge of technology and computer based training development. It’s now a huge operation since the merger with May Company, well over 900 stores in 47 states. The content of this magical, award-winning CD is departmentalized into modules: casegoods, upholstered furniture, beds and bedding, fibers and fabrics, leather furniture and rugs/carpets. Cleverly, each module is broken into digestible sections. The student can work at her/his own pace. It’s designed to fit all systems and degrees of expertise. There are more than 300 original illustrations, a total of 36 self-paced multimedia lessons, five in-store floor activities, printable certificates of completion for each module and more than 50 interactive practice activities. One of the secrets of the CDs’ universal acceptance is that it’s fun! And where, please tell us, is it written that learning can’t be fun? It’s the interaction that captures the attention, the non-irritating male and female voices that inform, praise and chastise, sometimes sending you back to re-examine modules and re-think your response to activities and tests. There’s something gleeful about printing out your own certificate of success at the end of each properly negotiated module! There’s a good mix, too, of relatively difficult and easy modules, and this, like the concept itself, is designed to enhance individual strengths and define areas of weakness. The student is encouraged to print-out useful activities pages that persuade them to venture out on the floor of their own store and put the brand new, shiny info into useful action. Mark is a veteran of the furniture industry, a trainer at TRPC Consulting for some years. “I went back to school, Utah State University and, after graduation, was hired by the University as a researcher. Then, with two colleagues, we turned research into practical application when we established LetterPress, a design firm specializing in scientifically based knowledge, delivered through the use of technology. Once the CD was perfected, “It needed to fly”. Mark approached Furniture World Magazine to market it. And the rest, of course, is history... recent history. 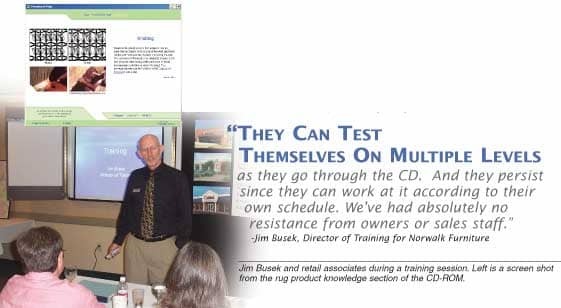 We caught Jim Busek, Director of Training for Norwalk Furniture’s 75 stores, in the midst of leading a sales training group. “We’ve distributed the CD to our entire franchise base from Vancouver to Ottawa and from Seattle to Boca Raton. We’re custom upholstery specialists, so we provide excellent training ourselves in the upholstery part of the programme, but the CD certainly helps the new franchisees with casegoods and rugs, the terminology and the background. Bruce Dunning joined AMI/Furniture Leaders when the buying group was established in 1972. He believes firmly that every furniture industry sales person in North America needs more knowledge. And he’s passionate about it! “Our 57 large retailers buy furniture in large quantities and bill centrally. You’ll find us in Montana, Wyoming, North and South Dakota, Idaho, Washington, Oregon, Utah and Alaska. And so is Tim Rooks. “We have curricula for all sales training efforts throughout the stores, point of sale, learning how to ask the right questions, how to greet customers. West California has reported back that the CD is making a difference in sales and there’s positive feed back from customers. And the sales people are enjoying using it. They love the CD, it’s providing basic information they can use and they can print the information at the end of the modules for further study. For more information contact FURNITURE WORLD, 877-235-3095, or e-mail educationcd@furninfo.com. The CD can also be ordered online at www.furninfo.com. Click here to go to the Online Store.